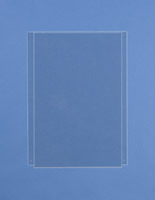 This Sign Supply is a Poster Holder Made from Clear Acrylic! Suspension Sets Hang Signage Displays in Storefront Windows to Increase Business! Buy This Sign Supply for 8-1/2" x 11" Prints from Our Massive Online Store! 8.5x11 Sign holder comes with (2) S-hooks for connecting to another frame. Designed to hang from the ceiling by a store front window. 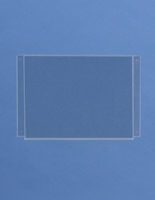 8.5x11 Sign holder is doubled-sided for two-directional visibility. Precision laser cut acrylic construction coordinates with any setting. 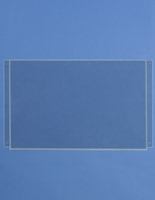 This 8.5x11 sign holder is an extension panel for existing widow displays. 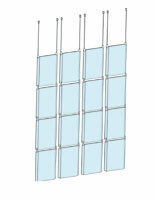 S-hooks are included for linking the frame to other units. The 8.5x11 sign holder, also known as a suspension display, hangs from the ceiling for use in a window or other highly visible location. 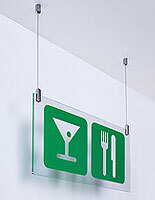 This ceiling-suspended 8.5x11 sign holder has a 100% acrylic construction. The signage area is non-reflective. Posters top-load into the 8.5x11 sign holder quickly and easily. Users can place two advertisements back-to-back in the frame. 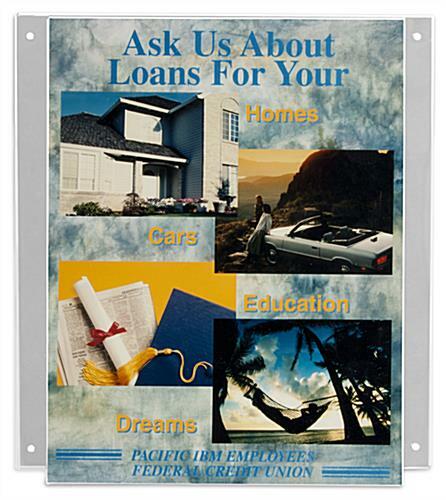 The 3/16" thick acrylic construction is completely clear and frameless, so this ceiling-mounted 8.5x11 sign holder provides a full view of standard size prints. 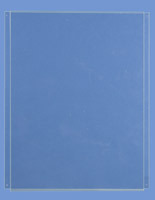 One benefit to advertising with these ceiling-hanging frames is new advertisements can quickly be printed on an office printer due to the standardized size of the signage area. The 8.5x11 sign holder that is acrylic has pre-drilled s-hook holes with a 3/16" diameter. So users hanging these poster frames with a custom mounting kit from the local hardware store need to check for compatibility. Additionally, the pre-drilled holes are 9-3/16" apart [center point to center point]. The frame must be used with existing window displays that have corresponding holes the same distance apart for the s-hooks to align properly. Reference the list of compatible accessories below. Window displays are incredibly popular among businesses located in busy commercial districts. Why are ceiling-mounted frames so popular? The reason is the poster display is a cost effective means of promoting a product to those passing a business. This acrylic frame is perfect for retailers in a mall as well. 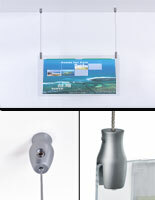 Start attracting new customers by expanding your current window poster display with these signage holders!